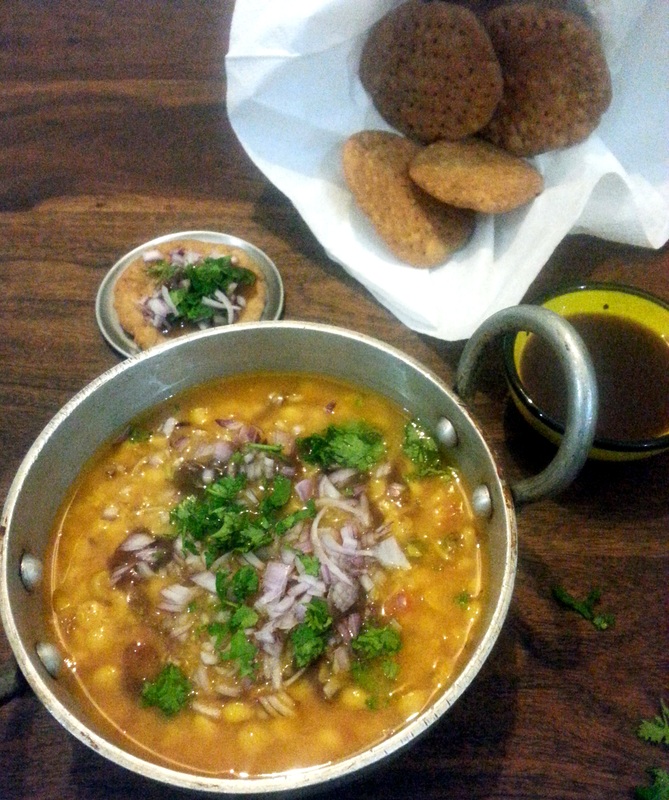 Daal Pakwaan is a common Sindhi Sunday breakfast item but for us it made a great appetizer! Crispy flat bread topped with spicy lentils and tangy tamarind chutney. It is a medley of flavour and textures. I got the recipe from this month’s Good Food India magazine. There was a time when the magazine was a monthly feature in my home but I hadn’t bought in a long time because actually I haven’t had a home in a long time :). Since the last few months, I’ve been a wandering pilgrim, finding a home wherever I go which currently happens to be in Chandigarh where my parents live. So without much delay, I present to you a totally delectable, delicious, mouth watering and asking-for-more daaaal pakwaaaan! PS: I don’t have a great camera while I’m traveling (space constraints) so have to make do with what my basic phone clicked. Boil the soaked chana dal with 2 cups water, turmeric and salt in a pressure cooker, for 3-4 whistles. Remove from heat but open the pressure cooker only after all the steam has escaped on its own. In a small pan, heat oil for tempering. Add asafoetida, cumin seeds and chopped green chili. Once the seeds start sputtering add the chopped tomatoes. Sauté for 3-4 minutes till tomatoes are cooked. Add Kashmiri red chili powder. Now add the tempering to the cooked daal. Put the daal in a serving bowl, sprinkle some amchoor powder, add tamarind chutney and sinely chopped onions and fresh coriander leaves. Meanwhile, knead the dough for the pakwaan/ papdi (crisp flat bread) by mixing the dough, salt and 1 tbsp oil with some water. The dough should have a medium- hard consistency. Let it rest for 10-15 minutes. Divide the dough into 6 balls. Roll each ball into a flat round and prick with a fork all over. Heat oil in a pan and deep fry the rolled pakwaans on a low flame until they are golden and crisp. Serve the pakwaans with daal and more tamarind chutney on the side. « Dry Fruit Laddooos in 5 mins!